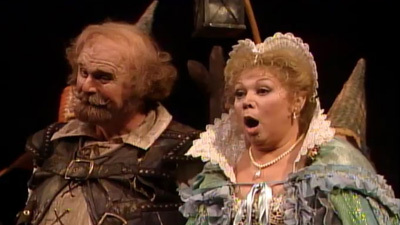 With more than 1,600 performances over the course of his 50-year-long Met career, Paul Plishka is nothing short of an operatic legend. 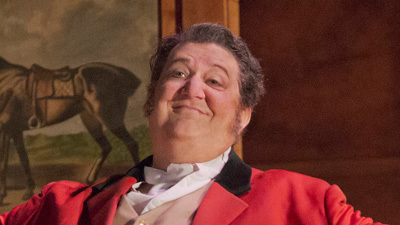 Though he began his career in smaller supporting roles, Plishka soon took on some of the most celebrated roles in the bass repertoire, including the title character of Verdi’s final operatic masterpiece, Falstaff. Alongside Plishka’s outlandish¬ yet lovable portrayal, Barbara Daniels sings an elegant Alice Ford, with mezzo-sopranos Margaret Lattimore and the beloved Marilyn Horne as her fellow wives of Windsor. Baritone Gino Quilico is an imposing Ford, and the bright-voiced soprano Barbara Bonney offers a charming portrayal as his young daughter Nannetta. Just four years after his making Met debut, tenor Paul Groves is the fresh-faced Fenton. James Levine conducts a buoyant performance of this classic comedy, keeping the audience laughing all the way to the heartwarming finale.